You can't really see it that well but I love it! It's something I've never tried before and it's fun. 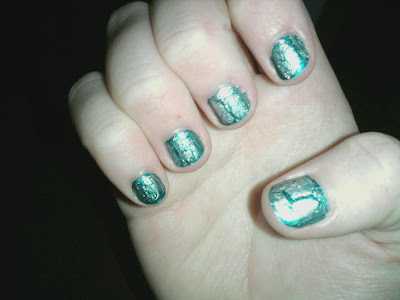 I'm probably really behind on the whole "crackle" look but oh well! Life's been great lately! Michael is still home with Emily and me until the end of the month and we have pretty much mastered the newborn thing. The only issue right now is getting her to sleep when we want to sleep but even that is not that big of a deal. I also don't mind having her in bed with me to sleep. Eventually we will need to have her sleep in her crib or pack n' play but for now...I love the closeness. Everything is going really well! She is a complete and utter joy in my life and I can't believe I am so blessed to have her. I love her so much! It may sound totally cheesy but having her has made my life feel so much more complete and meaningful. I was made to be her mommy! I love crackle. I have it on my toes now. Hope you and emily are doing great. I have a few giveaways up now and many more to come if you want to enter. How is Jexi doing with little miss Emily? Look at you stylin momma!!! Looks cute, I haven't tried it yet either. Glad to hear you took some "me" time! Glad you took some "me" time. Cute nail polish, too! It was good to hear how things are going! Good to hear how things are going! I kinda teared up at the end of this!! So sweet!! She is lucky to have you as a mommy! !